Being a dad I have to watch lots of television that I wouldn’t normally want to. I’ve sat through or heard in the background hours upon hours of children’s programs, some awful and some good. I can watch the “Wonderpets” or “Oswald” or “Kipper” 1Kipper is awesome. A small British dog that causes my 4-year old speak in a British accent following each viewing. 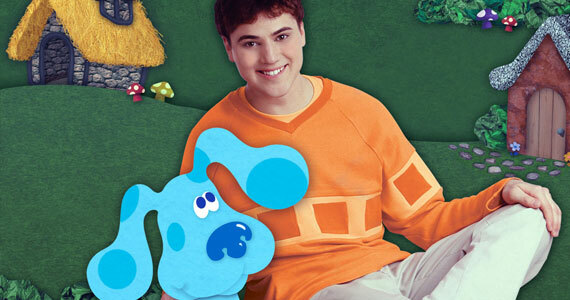 but when it comes to “Blue’s Clues” there are 2 camps: those that like Steve and those that like Joe. I prefer Steve but my youngest child prefers Joe. He is almost 2 years old though, so I won’t hold it against him. Joe, to the untrained eye, appears to be Joe-like, but he acts far more juvenile than Steve Burns ever did. Watching him you get the feeling, and it’s probably not Donovan Patton’s 2The guy that plays Joe fault. Steve, towards the end of his tenure on the show, seemed to be getting more and more cerebral. He would lift an eyebrow for effect here, a slight double-take there. He even used the word ‘jejune’ on the show. Then Steve’s brother Joe showed up right as Steve was going away to college. The producers probably wanted to go back to the more kid-friendly format of the early years of the show but after watching Burns Patton’s delivery seemed so pre-preschoolish. When singing the signature song he looks longingly at the screen like he honestly doesn’t remember from program to program that he needs to use his notebook or find a clue. For god’s sake, in one episode he didn’t know where his nose was. Or his ear. Who in their right mind doesn’t know where his nose is? If you’re Joe, then you don’t, obviously. The whole “Steve goes to college” angle was alright, since Burns wanted to leave the show, and, from his own website “we have male pattern baldness.” Steve was looking a little long in the tooth. But how could “Steve” get into college? He couldn’t find clues (as far as I know he only found one and that was in the “Blue’s Big Musical” episode) so how did he get into college? And what college is it? Stupid U? But at least Steve got into college. Joe, the stupid brother, has been stuck at home for years now, living out his pre-preschoolish existence with a talking mailbox, some talking salt and pepper shakers, and a bar of soap that wants to be a ship captain. Maybe Joe is crazy and the “Blue’s Clues” show is all in his head, or maybe Steve was crazy and, living in the Bluesiverse, made up a brother out of thin air so he could escape his own insanity. Think about it. It could happen. Sorta Being John Malkovich-esque. Or like the ending of “Saint Elsewhere”. Maybe Joe is dreaming up the whole thing. Wouldn’t surprise me if he did. Share the post "Man, Joe from “Blue’s Clues” is Dumb"
thank you. Joe is like Steve’s retarded brother now that he’s on the show. He has to put SO much effort into acting, and Steve did it so effortlessly it seemed. omg yes i totally agree !